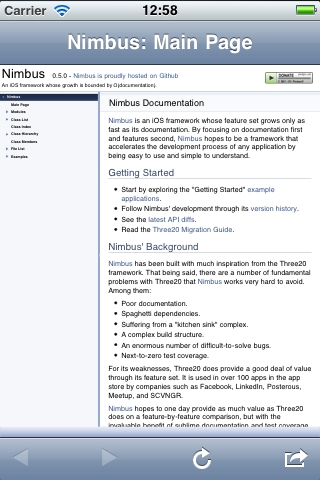 Version 0.6.1 of Nimbus was released on August 8, 2011. This minor version introduced the new Nimbus WebController, a ported version of Three20's TTWebController. LICENSE and NOTICE files have been added to the project. Contributions are highly encouraged! If you have a feature that you feel would fit within the Nimbus framework, feel free to fire off a pull request on GitHub. Bugs may be reported using the issue tracker on GitHub as well. Check out the tasks grab bag for opportunities to help out.